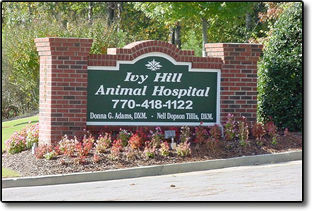 Ivy Hill Animal Hospital is a full service hospital for companion animals. We offer internal medicine, surgery and preventative care, as well as boarding and grooming. We appreciate the trust that you place in us by bringing your pet to us, and we treat each one as the family member that they are. 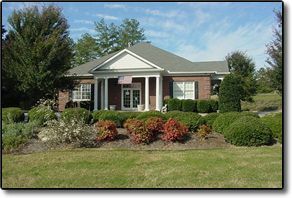 After practicing in the Atlanta area for 12 years, Dr. Donna G. Adams and Dr. Nell Dopson Tillis opened Ivy Hill Animal Hospital in 1997. Our goal is to provide state of the art medical care as well as ancillary services for your pet’s health and your convenience. Our staff brings a wide range of experience to caring for your pet, from members who have worked in veterinary medicine for 25 years to students pursuing an education in veterinary medicine. Each of them enjoys getting to know your pet individually and caring for them. We offer pet care, including annual physicals, vaccinations, dentistry, and spays and neuters. When your pet is sick we offer laboratory services in-house as well as from outside labs when more specialized testing is needed. We have excellent radiology services with a brand new, state of the art digital X-ray machine. And should your pet require surgery, we offer a sterile surgical suite for general surgery. We also offer boarding and grooming facilities. We have a fenced in yard area where we walk your pet so they get outdoor exercise while they are with us, and we have recently added a larger fenced in nature area which allows us to offer nature walks and play time for your pet.